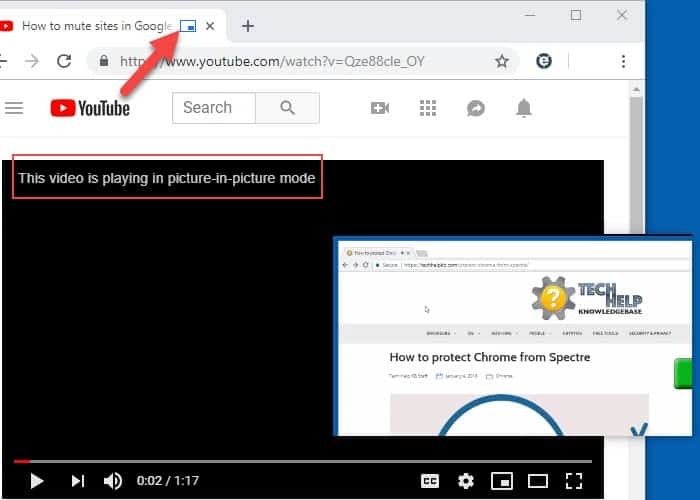 Users can now watch video in Chrome using Picture in Picture. Chrome 70 is chock full of goodies. 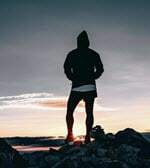 Some of the top additions include support for Progressive Web Apps (PWA), a Public Key Credential added to the Credential Management API and the option to opt-out of automatic Chrome sign-in. Perhaps the most useful addition for Chrome users is Picture-in-Picture (PiP). PiP dates back to the opening ceremony of the 1976 Summer Olympics in Montreal, Canada. At the time, viewers watched the opening ceremony on television with a close-up PiP of the Olympic flame. Safari 9 introduced PiP support for macOS Sierra users in September 2016, and Chrome introduced PiP support on Android O in early 2017. A new standardized Web API brings PiP support to Chrome 70. The idea behind PiP in Chrome is to allow users to interact with content on other websites and applications while PiP video content always floats on top. Here’s how to use it. 1. 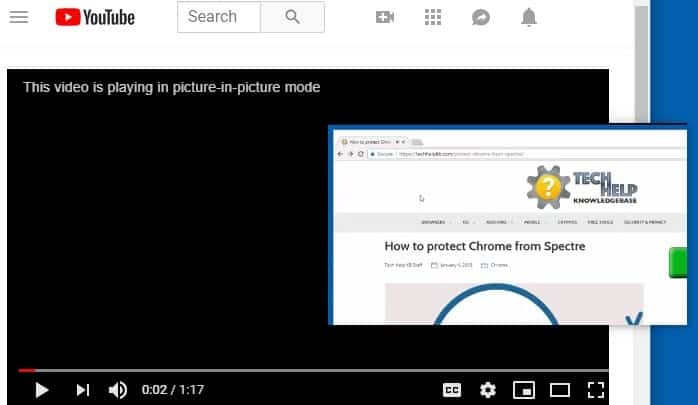 Chrome 70+ supports Picture-in-Picture, so make sure you are using the latest Chrome version. 2. Support for Picture-in-Picture varies by website since individual sites have control over enabling the functionality. 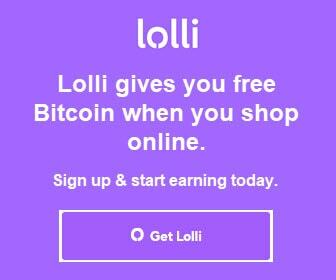 Fortunately, YouTube supports it so just navigate to any YouTube video to try it out now. 3. Play the video. 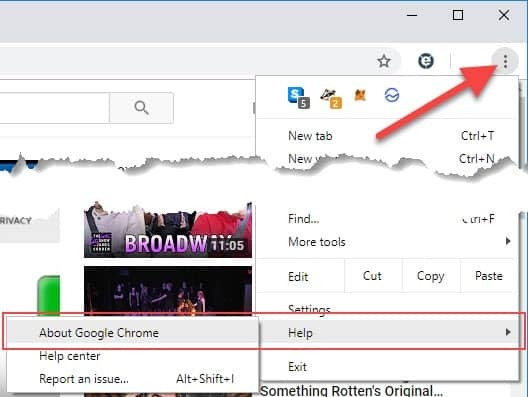 Right-click on the playing video two times to display the context menu. Choose Picture in Picture. in the originating tab. If you close this tab, the PiP video window will also close. When done watching, click the X in the PiP window to dock it back into the original window. 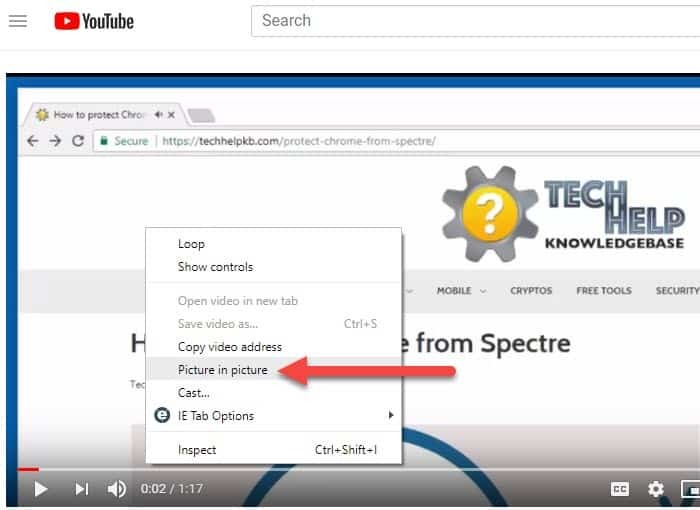 Thank you for visiting Tech Help Knowledgebase to learn how to watch video in Chrome using Picture in Picture.